Healthy Inside ~ Fresh Outside..!! 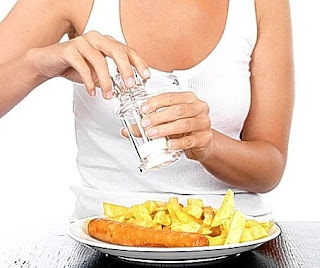 : How to tame your salt habit? Find out how much sodium you really need, what high-sodium foods to avoid, and ways to prepare and serve foods without adding salt or sodium. You've been trying to eat less sodium — just a pinch of table salt on your baked potato and a dash on your scrambled eggs. But a pinch here and a dash there can quickly add up to unhealthy levels of sodium. Consider that just one teaspoon of table salt has 2,325 milligrams (mg) of sodium. And it's not just table salt you have to worry about. Many processed and prepared foods already contain lots of sodium — and it's these foods that contribute the most sodium to your diet. If you're like many people, you're getting far more sodium than is recommended, and that could lead to serious health problems. See how sodium sneaks into your diet and ways you can shake the habit. But if for some reason your kidneys can't eliminate enough sodium, the sodium starts to accumulate in your blood. Because sodium attracts and holds water, your blood volume increases. Increased blood volume makes your heart work harder to move more blood through your blood vessels, which increases pressure in your arteries. Such diseases as congestive heart failure, cirrhosis and chronic kidney disease can make it hard for your kidneys to keep sodium levels balanced. Some people's bodies are more sensitive to the effects of sodium than are others. If you're sodium sensitive, you retain sodium more easily, leading to fluid retention and increased blood pressure. If this becomes chronic, it can lead to heart disease, stroke, kidney disease and congestive heart failure. The 2010 Dietary Guidelines for Americans recommend limiting sodium to less than 2,300 mg a day — or 1,500 mg if you're age 51 or older, or if you are black, or if you have high blood pressure, diabetes or chronic kidney disease. Keep in mind that these are upper limits, and less is usually best, especially if you're sensitive to the effects of sodium. If you aren't sure how much sodium your diet should include, talk to your doctor. Processed and prepared foods. The vast majority of sodium in the typical American diet comes from foods that are processed and prepared. These foods are typically high in salt, which is a combination of sodium and chloride, and in additives that contain sodium. Processed foods include bread, prepared dinners like pasta, meat and egg dishes, pizza, cold cuts and bacon, cheese, soups, and fast foods. Natural sources. Some foods naturally contain sodium. These include all vegetables and dairy products such as milk, meat and shellfish. While they don't have an abundance of sodium, eating these foods does add to your overall sodium intake. For example, 1 cup (237 milliliters) of low-fat milk has about 107 mg of sodium. In the kitchen and at the table. Many recipes call for salt, and many people also salt their food at the table. Condiments may also contain sodium. One tablespoon (15 milliliters) of soy sauce, for example, has about 1,000 mg of sodium. Taste alone may not tell you which foods are high in sodium. For example, you may not think a bagel tastes salty, but a typical 4-inch (10-centimeter) oat-bran bagel has about 532 mg of sodium, and even a slice of whole-wheat bread contains 132 mg of sodium. Reduced or less sodium. The product contains at least 25 percent less sodium than the regular version. You should check the label to see how much sodium is in a serving. Lite or light in sodium. The sodium content has been reduced by at least 50 percent from the regular version. You should check the label to see how much sodium is in a serving. But watch out — foods labeled "reduced sodium" or "light in sodium" may still contain a lot of salt. For example, regular canned chicken noodle soup contains about 1,100 mg of sodium per cup, so a product with 25 percent less sodium still has a whopping 820 mg of sodium per cup. The same holds true for "lite" or "light in sodium" varieties. Try to avoid products with more than 200 mg of sodium per serving. And check the Nutrition Facts label closely for the serving size — and consider how many servings you actually eat. Eat more fresh foods. Most fresh fruits and vegetables are naturally low in sodium. Also, fresh meat is lower in sodium than are luncheon meat, bacon, hot dogs, sausage and ham. Buy fresh and frozen poultry or meat that hasn't been injected with a sodium-containing solution. Look on the label or ask your butcher. Buy plain whole-grain rice and pasta instead of ones that have added seasonings. Make your own soups from scratch. Opt for low-sodium products. If you do buy processed foods, choose those that are labeled "low sodium." Remove salt from recipes whenever possible. You can leave out the salt in many recipes, including casseroles, stews and other main dishes that you cook. Baked goods are generally an exception since leaving out the salt could affect the quality and taste. Use cookbooks that focus on lowering risks of high blood pressure and heart disease to help guide you to sparing the salt without spoiling taste or quality. Use herbs, spices and other flavorings to enhance foods. Use fresh or dried herbs, spices, zest from citrus fruit, and fruit juices to jazz up your meals. And remember that sea salt has about the same amount of sodium as table salt. Use salt substitutes wisely. Some salt substitutes or light salts contain a mixture of table salt and other compounds. To achieve that familiar salty taste, you may use too much of the substitute — and get too much sodium. Also, many salt substitutes contain potassium chloride. Although potassium can lessen some of the problems from excess sodium, too much potassium can be harmful if you have kidney problems or if you're taking medications for congestive heart failure or high blood pressure that cause potassium retention. Your taste for salt is acquired, so you can learn to enjoy less. Decrease your use of salt gradually and your taste buds will adjust. After a few weeks of cutting back on salt, you probably won't miss it, and some foods may even taste too salty. Start by using no more than 1/4 teaspoon of salt daily — at the table and in cooking. Then throw away the salt shaker. As you use less salt, your preference for it diminishes, allowing you to enjoy the taste of the food itself, with heart-healthy benefits. It's an amazing paragraph for all the internet viewers; they will take benefit from it I am sure. to say that I've really enjoyed surfing around your blog posts. In any case I will be subscribing to your rss feed and I hope you write again soon! glad to search out numerous useful info here in the publish, we'd like develop more strategies on this regard, thank you for sharing. . . . . .
My site has a lot of unique content I've either written myself or outsourced but it seems a lot of it is popping it up all over the internet without my agreement. Do you know any techniques to help reduce content from being ripped off? I'd really appreciate it. It's an amazing piece of writing for all the web users; they will get benefit from it I am sure. Thanks for your personal marvelous posting! I actually enjoyed reading it, you're a great author.I will ensure that I bookmark your blog and will often come back in the foreseeable future. I want to encourage you to continue your great work, have a nice morning! You've made some really good points there. I checked on the internet for more info about the issue and found most people will go along with your views on this site. It's hard to come by experienced people on this subject, but you seem like you know what you're talking about! a lot up fast! What host are you the usage of?